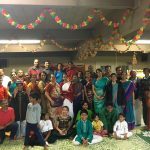 Categories: Hanumad Jayanthi, Hanuman, Rama, Satsang, Sita. 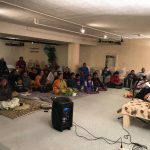 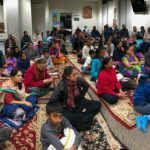 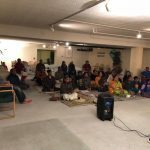 Sri Poornimaji delivered a lecture on the greatness of Hanumad Prabhavam in a community hall organized by Sri.Sankar and Smt.Kamala Sankar in Cupertino on Wednesday, December 20th 2017 from 7:15pm to 8:30pm. 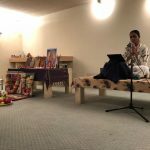 She began with an introduction to what a satsang means and how one is indeed chosen by the lord to take part in a satsang and talked about gratitude. 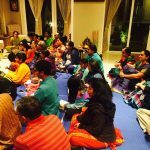 The power of satsang in the context of Ramayana was beautifully explained in a soul-stirring manner. 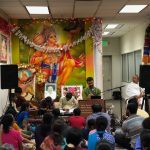 Sugreeva, who had lost everything and was battling for the safety of his life got back everything and was crowned as the king which was verily because of being in a communion with Hanumanji and talked about the role of Hanumanji as a Guru in entire Ramayana. 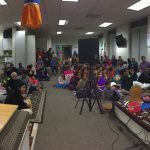 Hanumanji’s life-history was wonderfully explained and how he came to be known as Hanuman. 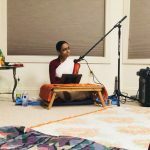 Sri Poornimaji then talked about Samartha Ramadas who had the amsa of Hanuman and how his incarnation showed the power of chanting the divine name Rama. 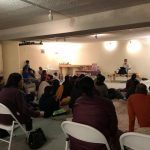 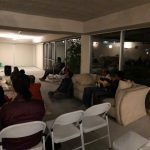 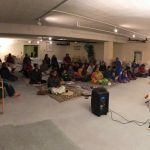 The satsang was attended by over 40 people.